As so many new camera owners are starting out with photography in the new year I thought I’d compile a list of photography tips and techniques that new camera owners might like to work through in the coming weeks. Some are very basic while others go a little deeper – but all have been selected from our archives specifically for beginners and new camera owners. Enjoy. 1. Digital Camera Modes Explained – I spoke with a family friend recently who had just bought a new point and shoot camera. She came up to me with her camera when no one was watching and embarrassedly asked me if I could tell her what all the little icons on the dial on top of her camera meant. 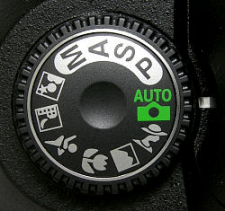 This article explains what each of these most common digital camera modes means and does. Knowing them can take your shots to the next level. 2. Aperture and Shutter Priority Mode – this introduction talks you through these two very useful settings that can be found on many digital cameras. Aperture and Shutter Priority modes take you out of Automatic mode giving you more control over your images – but don’t thrust you fully into manual mode – they are great settings to explore and master. 3. Introduction to White Balance – one of the most common problems that I see in beginner photographer images are shots with incorrect color. We’ve all seen them – portraits where your subjects teeth and eyeballs (and everything else) has a yellowish tinge. Learn what causes this and how to combat it with this tutorial on White Balance. 4. Understanding Histograms – ‘histograms are scary’ – this is what one reader said to me recently when they discovered that they could view these little graphs or charts on their camera. While they might seem a little technical it is amazing how simple a histogram is to interpret. Know what you’re looking for and with just a glance you’ll know if your image is under or over exposed. It’s a useful tool to master. 5. Automatic Exposure Bracketing (AEB) – this feature is another of those often unexplored settings that many cameras have built into them that will allow you to get well exposed shots in even the trickiest of lighting situations. 6. How to Hold a Digital Camera – this beginner tutorial covers a topic that most camera owners skip over without realizing that it is a foundational lesson in photography. Get this wrong and it can impact the quality of your shots. 7. Shutter Release Technique – another ‘basic’ or ‘beginner’ type tip that many do intuitively – but which can drastically improve your photography if you don’t do it. 8. How to Use Focal Lock – yet another beginner technique that many of us take for granted yet which is at the core of how all digital cameras focus automatically. Get this wrong and you’ll take a lot of shots of out of focus subjects and in focus backgrounds! 9. How to Take Sharp Digital Images – ‘my shots are fuzzy’ – it’s a common problem that we’re asked about at DPS so we wrote this tutorial to refer people to to help them get the sharpest images that their camera can take. 10. Shooting with an In Camera Flash – flash photography with an in built flash can lead to some terribly blown out images – here are a few tips on how to avoid them. On a similar topic – here’s 7 Strategies for Avoiding Flash Blow Out. 11. How to Get Shallow Depth of Field in Your Digital Photos – a great technique to learn if you’re into many types of photography (portraits, macro etc) is how to control the depth of field in your shots and make your main subject ‘pop’ out by making your background nicely blurred – this tutorial talks you through how to do it. 12. Understanding Exposure – this post talks new camera owners through the three main elements of Exposure. Once you’ve read it also check out our introductions to ISO, Aperture and Shutter Speed. 13. How to Avoid a Dirty DSLR Sensor – one of the fastest ways to ruin every single shot you take with your new DSLR is to end up with a dirty image sensor. This tutorial gives some basic tips on how to ensure it stays as clean as possible. 14. How to Clean a DSLR Lens – as much as you try to protect them – lenses tend to get a little grimy over time. This tutorial shares some basic tips on how to clean them up so that your shots will be as clear as possible. 15. 7 Digital Camera Predators and How to Keep them at Bay – this tutorial talks you through 7 of the most common ways that digital cameras get damaged – what to look out for and what preventative action to take to avoid them. 16. The Rule of Thirds – whether you know it to follow it or break it – it’s something you should at least know about. 17. Points of Interest – an image without some visual point of interest in it is unlikely to hold the eye of anyone viewing it. 18. Getting Horizons Horizontal – the perfect way to ruin that lovely sunset or landscape shot is to make it lean to one side. Get your Horizon Horizontal! 19. Fill Your Frame – this is not applicable to every shot you take but many photographers could drastically improve their photography by getting in close to their subject and filling their frame. 20. Getting Backgrounds Right – the background of your shot can make or break your image. This tutorial talks you through a number of things to look out for and techniques to use to get them just right. 21. Adding Randomness to Your Photos – learn how to set your images apart from everyone else’s by injecting creativity, variety and a little randomness into your shots. Of course the above 21 Settings, Techniques and Rules for beginner camera owners just scratch the surface of all there is to learn about the art of photography. Subscribe to our blog here (via email or RSS) to get more free daily tips to help you keep improving and learning.